A car’s catalytic converter is attached to its exhaust system and converts toxic emissions into less harmful byproducts. It contains corrosion-resistant noble metals – typically platinum , palladium , and/or rhodium  – in relatively small quantities. Those relatively small quantities are becoming relatively more valuable, especially in the case of palladium. “Soaring palladium prices are inspiring an unusual band of criminals: catalytic converter thieves,” reported the Wall Street Journal . In February, palladium prices  spiked to a record $1,550/oz where they have remained. Platinum , for example, now trades at an historically large discount verses its sister metal palladium. The discount (now close to $700/oz) is all the more interesting given that platinum is a viable substitute for palladium in catalytic converters. Electric vehicle batteries do require other metals, including lithium, cobalt, and nickel. The computer-controlled electronic systems in today’s cars also contain some silver . Unlike platinum and palladium, silver has a long history of use as money. Even though silver is no longer minted into coins  meant for circulation, it is still sought after by investors in coins and other forms for wealth preservation, inflation protection, and possible future use in barter or trade. 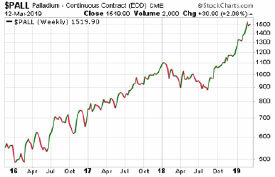 Craig Hemke of the TF Metals Report  warns the COMEX could declare a force majeure because only 42,000 ounces of palladium exist in their vaults – only enough for 420 contracts. Stefan Gleason is President of Money Metals Exchange , a precious metals dealer recently named "Best in the USA" by an independent global ratings group. A graduate of the University of Florida, Gleason is a seasoned business leader, investor, political strategist, and grassroots activist. Gleason has frequently appeared on national television networks such as CNN, FoxNews, and CNBC and in hundreds of publications such as the Wall Street Journal, TheStreet.com, and Seeking Alpha.